Docker Swarm is a popular Orchestration solution. 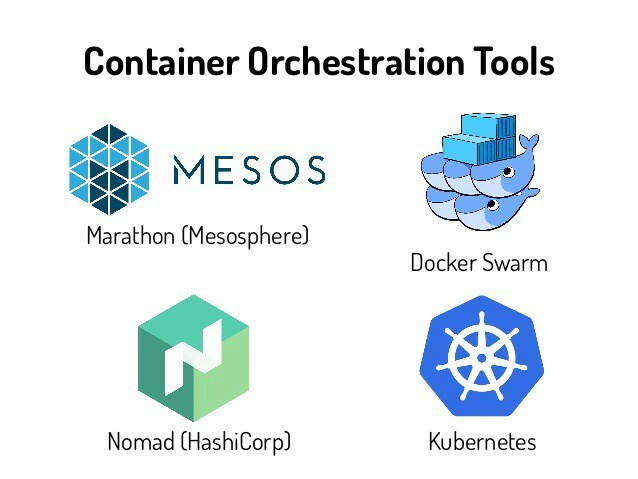 Some open source orchestration solutions are: Docker Swarm, Kubernetes, Apache Mesos, OPENSHIFT, Nomad etc. A set of nodes with at least one master node and several worker nodes that can be virtual or physical machines. The tasks defined by a swarm administrator that a manager or agent nodes must perform. It defines which container images the swarm should use and which commands the swarm will run in each container. A service in this context is similar to a microservice; for example, it’s where you’d define configuration parameters for an nginx web server running in your swarm. Parameters for replicas also define in the service definition. Manages the state of the swarm to which it belongs. Worker nodes run tasks distributed by the manager node in the swarm. Each worker node runs an agent that reports back to the master node about the state of the tasks assigned to it, so the manager node can keep track of services and tasks running in the swarm. Tasks are Docker containers that execute the commands you defined in the service. Manager nodes assign tasks to worker nodes, and after this assignment, the task cannot be moved to another worker. If the task fails in a replica set, the manager will assign a new version of that task to another available node in the swarm. Docker Machine is a tool that lets you install DockerEngine on virtual hosts, and manage the hosts with docker-machine commands. Note: If you encounter docker-machine:Error with pre-create check: “exit status 126” you will have to install virtualbox on your machine. Swarm initialized: current node (vq7xx5j4dpe04rgwwm5ur63ce) is now a manager. run docker node ls to verify manager. It will work only in swarm manager not in worker . You can check by running this command from worker machine in your terminal if you want. Note: This docker swarm init command generates a join token. The token makes sure that no malicious nodes join the swarm. You need to use this token to join the other nodes to the swarm. Now that we have our three-node Swarm cluster initialized, we’ll deploy some containers. 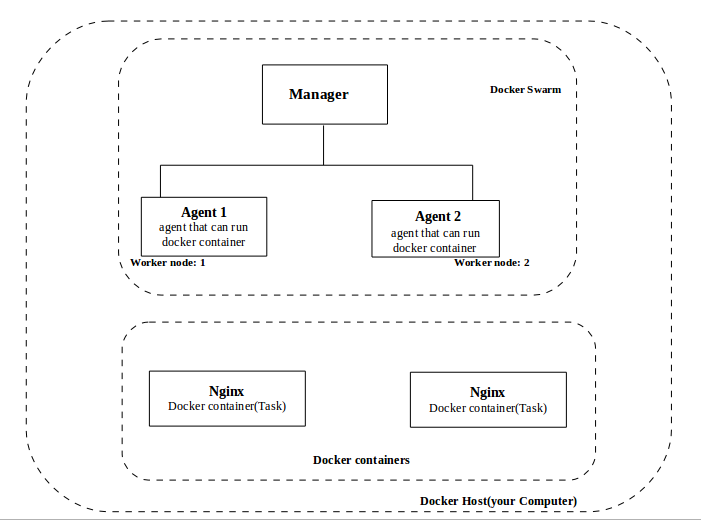 To run containers on a Docker Swarm, we need to create a service. Note: A service is an abstraction that represents multiple containers of the same image deployed across a distributed cluster. Let’s do a simple example using NGINX. For now, we’ll create a service with one running container, but we will scale up later. 2. --name: Gives a name to the container in our case it's 'nginx1'. 3. --mount: NGINX print out the hostname of the node it's running on. 2. --publish: Uses the swarm's built-in routing mesh. In this case, port 80 is exposed on every node in the swarm. The routing mesh will route a request coming in on port 80 to one of the nodes running the container. 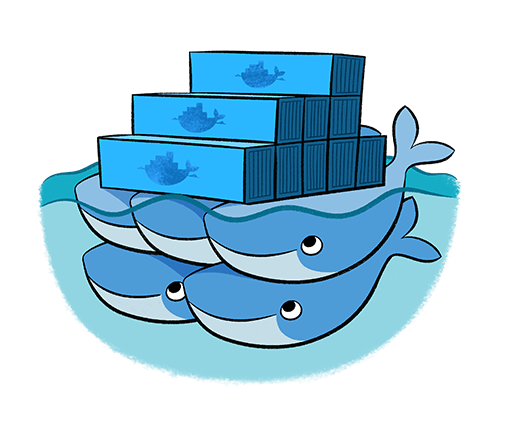 This command statement is declarative, and Docker Swarm will try to maintain the state declared in this command unless explicitly changed by another docker service command. A task is another abstraction in Docker Swarm that represents the running instances of a service. In this case, there is a 1–1 mapping between a task and a container. Because of the routing mesh, it is possible to send a request to any node of the swarm on port 80. This request will be automatically routed to the one node that is running the NGINX container. Use the docker service command to update the NGINX service that we created previously to include 5 replicas. This is defining a new state for the service. The state of the service is updated to 5 replicas, which is stored in the swarm’s internal storage. Docker Swarm recognizes that the number of replicas that is scheduled now does not match the declared state of 5. Docker Swarm schedules 5 more tasks (containers) in an attempt to meet the declared state for the service. This swarm is actively checking to see if the desired state is equal to actual state and will attempt to reconcile if needed. 3. Send a lot of requests to http://localhost:80. Now when you send requests on port 80, the routing mesh has multiple containers in which to route requests to. The routing mesh acts as a load balancer for these containers, alternating where it routes requests to. Note: it doesn’t matter which node you send the requests. There is no connection between the node that receives the request and the node that that request is routed to. Another easy way to see which nodes those requests were routed to is to check the aggregated logs. You can get aggregated logs for the service by using the command docker service logs [service name]. # you can see that each request was served by a different container. Now that you have your service deployed, you’ll see a release of your application. You are going to update the version of NGINX to version 1.13. # This triggers a rolling update of the swarm. You have successfully updated your application! Note: You must run the stop and rm command from outside. Neither from manager nor from worker machine. you can check my previous article to see how to dockerize a flask application clicking here https://medium.com/@tasnuva2606/dockerize-flask-app-4998a378a6aa?source=friends_link&sk=93569352f150bf5e6141abc152654734. Congratulations!! By now You’ve understood docker swarm well, aren’t you? ?